From memorialising landmarks and parks to identifying buildings and creating awards, customised metal plaques from New Style Signs Ltd, serve your purpose well, with beauty and lifetime durability. Our premium metal plaques are versatile and durable, plus they provide instant beauty to the surfaces to which they’re attached. From the classic look of cast metal to the precise etching process, you can be assured of having a one-of-a-kind award, memorial, office sign, architectural sign, or other piece that you can proudly put on display. 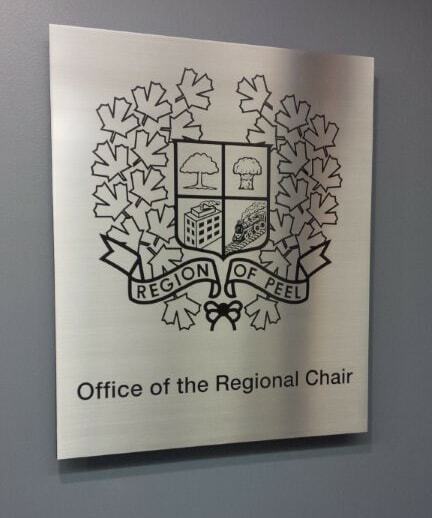 Durable, time-honoured metal plaques are available in a variety of metals and depths. With polished or brushed surfaces, natural or painted backgrounds, and a wide range of other special treatments, our plaques are a classic, timeless option. Do I Need Metal Plaques? Individuals and families – They can use plaques as gifts to honour a soldier, remember family members, commemorate special achievements, or for celebrating the completion of constructing a new home. They can also be given as housewarming gifts. Communities and park districts – Plaques can be used in historic monuments, parks, and people highly valued by the community. Universities and school districts – Plaques can be used for buildings, crests, and assets considered valuable in the school’s history. For instance, it is customary to honour donors, athletes, and officers who have positively impacted the institution. Building owners and managers – They can use plaques for acknowledgement as a top-tier tenant suite. Health care facilities – Use plaques for donor recognition and dedications, or to designate special areas and departments. Hotels – Use plaques to give their sign systems a classy look. Libraries – Use plaques to recognise donors and dedicate buildings. Zoos – Use plaques for photos, stories, and illustrations, as well as for directional signs and animal enclosure identification. Firms and companies – Accounting firms and law offices can use plaques to identify headquarters’ lobbies and facilities. Sports organizations – Used to commemorate sporting teams, athletes, coaches, supporters, and events. Public and private organizations – Used to commemorate both the famous and infamous. New Style Signs Ltd uses advanced etching and engraving technologies that enable clients to add custom images and shapes to their metal plaques. This is particularly important for businesses looking to use our plaques for branded directory signs, office signs, and ADA signs. They are the upscale option for a permanent sign that you want to last for decades, and the ideal option to show your appreciation for an award-winner or long-time employee.